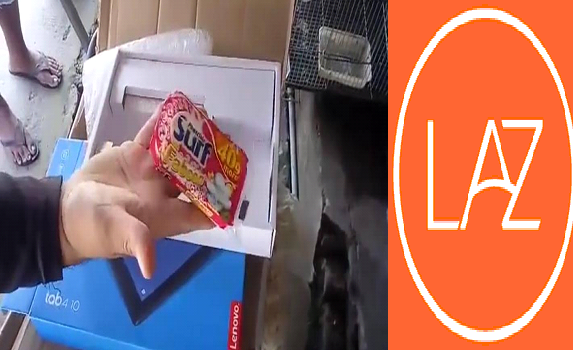 On a Facebook video post of Anthony, he said that he ordered Lenovo tablet worth of ₱12,000 as a present to his child's birthday in LAZADA, but after the said item was delivered upon opening the box, he was shocked when he noticed that the item inside is nothing but a piece of a Surf bar soap. "I ordered online po ng 12K Lenovo tablet pero pagbukas namin ang laman ay isang piraso ng Surf na sabon, gift ko sana sa anak ko 'yon kasi birthday niya," He said. The said video becomes trending in social media with over 500, 000 views, and 5, 000 comments and likes. LAZADA online company has been reported for different cases of anomaly that gets viral in social media. Some of those are a stone package that was sent to a buyer, cellular phone that becomes medicines, school supplies became toilet tissues, and many more. "Nag-order ako ng turbo timer sa Lazada worth 2,400 plus then when I received the box I open it immediately wow ang laman ng box is a rubix cubes," Cristy Rodriguez said on his comment. "Recently nag-order ako ng Hot Shapers, ang dumating sabon panligo. Next order was Birthstone Bracelets, ang isa lang ang tama and the other one was a BUTTON. Yes butones! Before ako nag-oorder binabasa ko ang reviews and rate ng supplier. Baka daw sa courier or ang packer nila ang problema." a concerned netizen insisted. But then, there are also many people that felt doubtful about the alleged video, because it may be a scripted only as some netizens are not contented on its reliability. "I don't think someone would react that way. It's obvious that it's scripted and that they only made that video for views, likes, and shares." one of the commentators said. Online-selling buyers are now demanding and requesting for the urgent response of the Department of Trade and Industry (DTI) in these cases of the anomaly of one of the known online-selling companies, LAZADA.